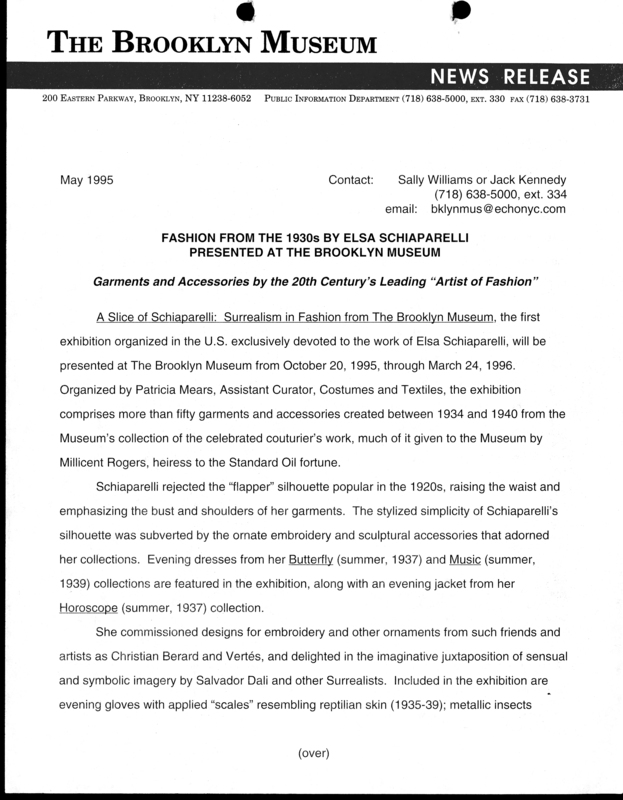 May 1, 1995 A Slice of Schiaparelli: Surrealism in Fashion from The Brooklyn Museum, the first exhibition organized in the U.S. exclusively devoted to the work of Elsa Schiaparelli, will be presented at The Brooklyn Museum from October 20, 1995, through March 24, 1996. Organized by Patricia Mears, Assistant Curator, Costumes and Textiles, the exhibition comprises more than fifty garments and accessories created between 1934 and 1940 from the Museum’s collection of the celebrated couturier’s work, much of it given to the Museum by Millicent Rogers, heiress to the Standard Oil fortune. Schiaparelli rejected the “flapper” silhouette popular in the 1920s, raising the waist and emphasizing the bust and shoulders of her garments. The stylized simplicity of Schiaparelli’s silhouette was subverted by the ornate embroidery and sculptural accessories that adorned her collections. Evening dresses from her Butterfly (summer, 1937) and Music (summer, 1939) collections are featured in the exhibition, along with an evening jacket from her Horoscope (summer, 1937) collection. She commissioned designs for embroidery and other ornaments from such friends and artists as Christian Berard and Vertés, and delighted in the imaginative juxtaposition of sensual and symbolic imagery by Salvador Dali and other Surrealists. Included in the exhibition are evening gloves with applied “scales” resembling reptilian skin (1935-39); metallic insects creeping across a day suit and necklace (autumn, 1938); and gilt hand mirrors, shocking as oversized suit pins (spring, 1938). Schiaparelli was born in Rome in 1890 to a family of conservative, well-to-do intellectuals. En route to New York in 1919 she met the artist Francis Picabia and his wife Gaby, who introduced her to the many other artists in New York and, later, in Paris. Through them she came to know Berard, Dali, Marcel Duchamp, Jean Cocteau, and the couturier Paul Poiret, who greatly admired the clothing she designed for Gaby and herself. She produced a few small sportswear collections beginning in 1925, featuring sweaters with trompe l’oeil designs that attracted a loyal following of admirers. By 1934, she employed 400 craftspeople and was recognized as a leading designer by French Vogue. Schiaparelli spent the duration of World War II in New York, returning to Paris in 1945. She opened a branch of her fashion house in the U.S. for mass production in the 1950s and maintained her Paris perfume interests until her death in 1973. Brooklyn Museum Archives. Records of the Department of Public Information. Press releases, 1995 - 2003. 01-06/1995, 004-5.